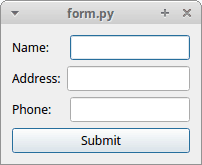 Learn about adding event handling and creating a simple form when getting started with Qt for Python. The Qt Team recently posted that Qt will now be officially supporting the PySide2 project, which they are calling Qt for Python. It will be a complete port of the original PySide, which only supported Qt 4. PySide2 supports Qt 5. Qt for Python will have the following license types: GPL, LGPL, and commercial. That's kind of a boring example, so let's look at how we might connect an event to a button. Here we create a text box via the QLineEdit widget along with a button via the QPushButton widget. Then we put both of those widgets inside of a QVBoxLayout, which is a container that will allow you to change the size of the application and have the widgets contained inside of the layout change sizes and position accordingly. In this case, we use a vertically oriented layout, which means that the widgets get "stacked" vertically. I think that looks alright, but it's still not a very interesting looking UI. In this code, we use several box layouts to arrange the widgets on screen. Namely, we use a QVBoxLayout as our top-level layout and then nest QHBoxLayouts inside of it. You will also note that when we add the QHBoxLayouts, we tell them to stretch when we resize the main widget. The rest of the code is pretty much the same as what you have already seen. I haven't played around with PySide2 (or PyQt) in a number of years, so it was exciting to see Qt picking this back up again. I think having some competition between PySide2 and PyQt will be a good thing and it might also drive some innovation with other Python UI frameworks. While the developers behind PySide2 don't have current plans to support mobile platforms, unfortunately, they do seem interested in hearing if that's something that developers would be interested in. Frankly, I hope a LOT of people chime in and tell them yes because we need other options in the Python mobile UI space. Anyway, I think this project has a lot of potential and I look forward to seeing how it grows.